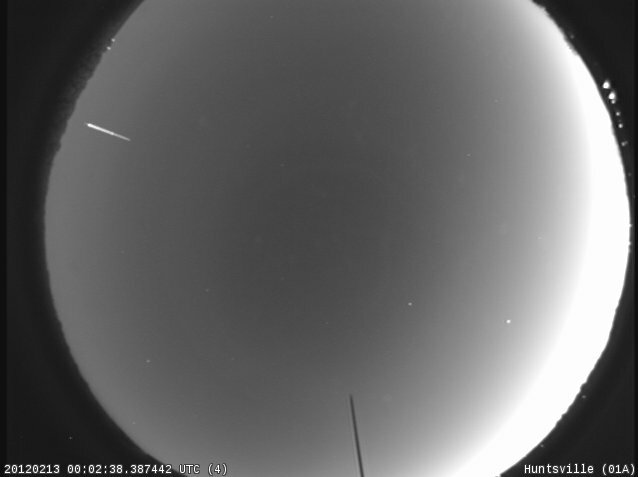 There was a bright fireball visible over north Georgia, eastern Tennessee, and South Carolina at 7:02:36 PM EST last night. 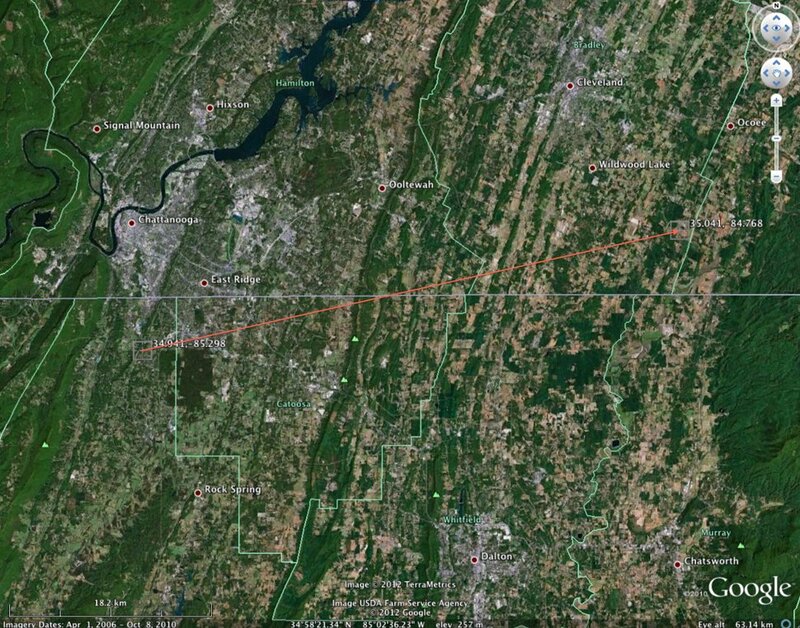 All 4 NASA meteor cameras in the SouthEast picked it up 48 miles above the town of Rossville, just south of Chattanooga, moving at 9 miles per second (32,400 mph) slightly north of east. 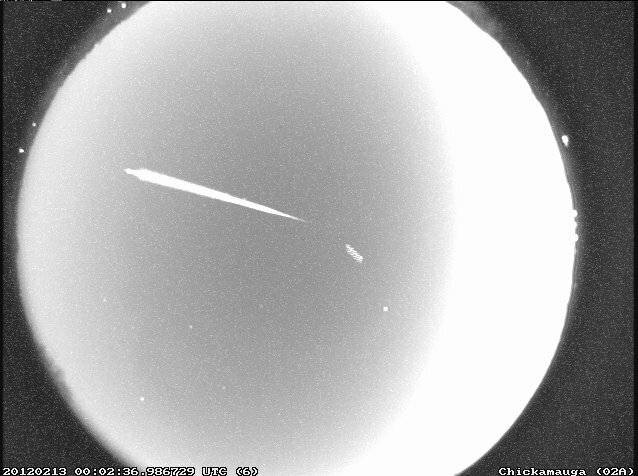 The meteor appears to have ablated (“burned up”) at 23 miles altitude SW of of Ocoee, TN. Though unusual, it is unlikely that this object produced any noticeable meteorites on the ground. Orbit indicates that this meteor was asteroidal in origin, with an aphelion (farthest point from the Sun) in the main asteroid belt between Mars and Jupiter. Asteroid 433 Eros made a close approach to Earth the morning of January 31st coming within 0.17 AU (15 million miles) of our planet. In this set of images taken that morning, the bright moving dot near the center of the field is the 21 mile long Eros. Somewhere on that tiny point of light rests a United States spacecraft — Near Shoemaker — which touched down on the asteroid’s surface on February 12, 2001 after completing 230 orbits around Eros. In the animation you will also notice over 20 streaks of light moving almost horizontally across the field of view. What we did not realize at the time of imaging was that Eros was at approximately the declination of geosynchronous communication satellites! These satellites are orbiting some 22,236 miles above the earth in the “Clark belt.” We were able to identify most of the satellites seen and found quite a variety. Included in the video are Brazilian satellites (Brazilsat B2, Star One C2); American satellites (Galaxy 11); Canadian satellites (Nimiq 4, Anik F1); Venezuelan satellites (Venesat-1); weather satellites (GEOS 12); television satellites (DirecTV 1-R); radio satellites (XM 3, Sirius FM); and Internet satellites (WildBlue – 1). The night sky is constantly changing. The Earth rotates and revolves about the sun, creating a backdrop of stars that is always in motion. The moon grows large in the sky, and then smaller again, in a seemingly endless cycle. Now and then, brilliant streaks of light can be seen in the night sky, there and gone again in a split second. These “shooting stars”, also called meteors, are seen when bits of rock and ice, the leftovers from voyaging comets and asteroids, enter the atmosphere and ablate, or burn up. These tiny travelers, and the light they produce, are the concern of the NASA Meteoroid Environment Office, or MEO, at the Marshall Space Flight Center which is responsible for understanding the meteoroid environment spacecrafts may encounter during missions. To more closely track and study bright meteors called fireballs, the NASA All Sky Fireball Network watches the skies with six specialized black and white video cameras set up in four states scattered across the Southeast and Southwest. The network’s multiple cameras provide overlapping views of the night sky, thus able to detect the same fireball to allow calculation of its location, speed, and orbit. 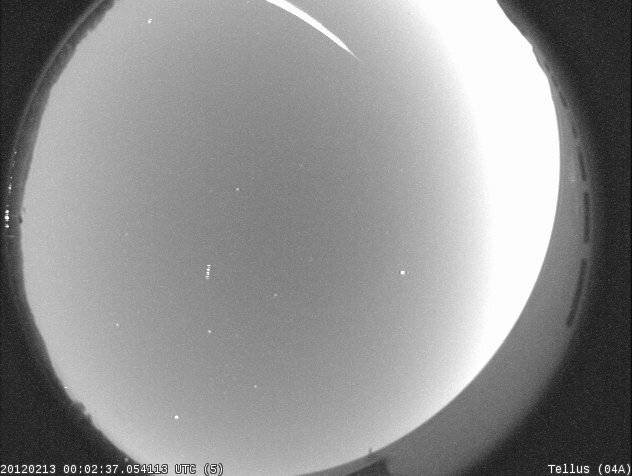 The network, established by the Meteoroid Environment Office in 2008, sees several multi-station meteors (those detected by more than one camera) each night. The resulting fireball data — in the form of images, movies, diagrams, and text files — is posted online daily. The office uses this data to construct models of the meteoroid environment, something very important to spacecraft designers. 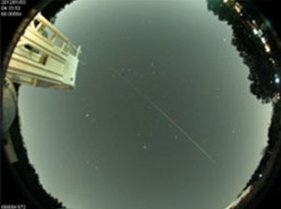 With cameras now in Alabama, Georgia, Tennessee, and New Mexico, the NASA All Sky Fireball Network plans to expand into North Carolina and beyond in 2012. The ultimate goal is a network of about 15 cameras in the United States in science centers, planetaria, and schools. To engage students, and promote STEM (science, technology, engineering, and math) disciplines in the classroom, the MEO has created a workshop for educators with information about meteors, a description of the network, and suggestions for how to use the data in the classroom.